From beginnings, in Turin, Italy the federation began as an initiative of five Turin-based rowing clubs (Armida, Caprera, Cerea, Eridano, and Esperia). The very first assembly was held on 31 March 1888 with a regatta calendar planned and approval of Statutes. Count Edoardo Scarampi di Villanova was the first elected president. Since then there have been 19 presidents with the most recent (from 2013) being Olympic Champion, Giuseppe Abbagnale. But to look at how the 1888 formation of the federation occurred, we need to go back in time to 1861. This was the year of the unification of Italy, during which ‘Canottieri Limite’ was founded – the first and oldest rowing club in the country. Under King Umberto di Savoia the name became the Regio Rowing Club Italiano (RRCI) have the Royal Italian Rowing Federation (Reale Federazione Italiana di Canottaggio). When Italy became a republic in 1946, the ‘Royal’ prefix was removed and the name Italian Rowing Federation began (Federazione Italiana Canottaggio). In the 130 years of the Italian Rowing Federation, there have been 38 Olympic medals (ten gold, 14 silver, and 14 bronze), a gold medal at the Beijing 2008 Paralympic Games and a gold at the 2018 Youth Olympic Games. There have also been hundreds of medals that the World Championships from senior through to under-23, junior and coastal as well as medals at the European Championships and World Rowing Cups. 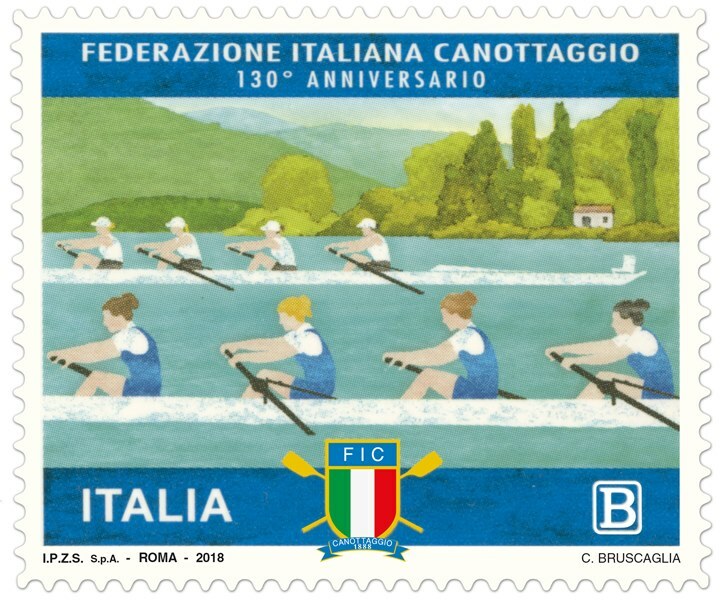 To remember the entire rowing community that has gone through the 130-year span, a commemorative stamp was issued by Italy’s Ministry of Economic Development. The art work depicts a coxless four (the boat that Italy has won many medals in). It shows the natural environment of rowing and includes a women’s crew which indicates the future in Italian rowing with the hope of seeing a women’s boat in an Olympic final. This is a commitment that the Federation has set itself to bring gender equality in competitive rowing.